According to ‘the king of resorts’ Bill Bensley, an architectural masterpiece must appreciate its environment and “rely on” natural beauty to shine in a different way. 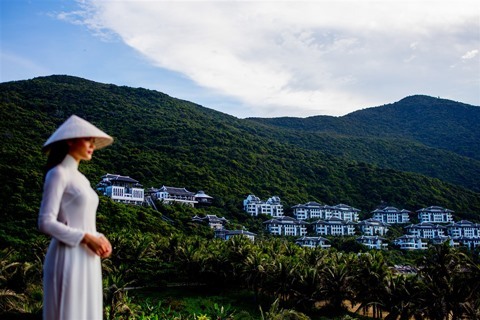 InterContinental Danang Sun Peninsula Resort is a testament to Bensley’s architectural philosophy. At the end of 2016, I met Bill Bensley at the resort on Sơn Trà Peninsula. When I asked him how he felt each time he came back to InterContinental Danang, he said: “Like coming home.” And what he was most fond of in this house is that it is greener every day. "I tried to minimise the impact on the environment during construction. And now, things have turned greener and even more natural than before. I really love this place, so all I do is try to build a location that allows people to live with nature," Bill Bensley shared. It is not difficult to prove Bill Bensley right. Walking the wooden stairs connecting the Sea floor to the Paradise floor at the resort, the architect explains why the stair winds around. 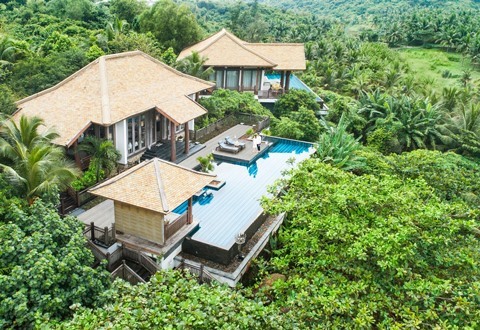 Bensley agreed with the owner of the resort – the Sun Group – that for the path of the wooden stairway, there should be no trees cut down, rather the walkway should curve to accommodate the trees. That principle has been respected, in the six years it took to build the resort, and even when it was embellished to welcome the APEC delegation in 2017. If you explore the resort, from the Heaven floor to the Sea floor and then to the beach, you will see primitive forests, legendary hills, white sandy beaches along the blue ocean, in the most wonderful beauty of natural creation. And so, it is not surprising that the ‘World’s most luxurious resort’ has been honoured by the World Travel Awards (WTA) Asia Australasia with five awards, including ‘Asia’s Most Nature-Friendly Resort 2018’. In addition to the many awards, the resort has its own zoologist. James Morrison has been working in conservation since 2011 in the Kruger National Park, South Africa. He is passionate about nature and he came to Việt Nam to teach and study the environment at the National University of Hà Nội. After many explorations and research in national parks in Myanmar, Bangladesh and Nepal, he decided to return to Việt Nam, as the Head of the Conservation Department at Pu Mat National Park for the Save Vietnam’s Wildlife organisation. And now it will be a pleasant surprise when James Morrison becomes the zoologist of the InterContinental Danang Sun Peninsula Resort. 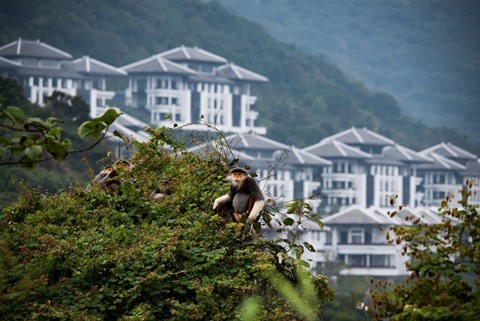 A prestigious and luxurious resort that has its own zoologist is hard to find in any other resort, not only in Việt Nam but also around the world. James Morrison and his colleagues at the InterContinental Danang Sun Peninsula Resort have taken a series of practical steps, from upgrading the LED system to reducing energy consumption by 75 per cent, reducing emissions that harm the environment. Moreover, 100 per cent of profits from souvenir sales at the resort are donated to a non-governmental organisation to protect the brown-legged langur. When visitors stay at the resort, James Morrison and his colleagues can share a remarkable amount of knowledge about wildlife, as a meaningful way of communicating with one another to protect the habitat. Creating a super-luxury resort in the middle of a pristine peninsula, Bill Bensley has made a masterpiece. 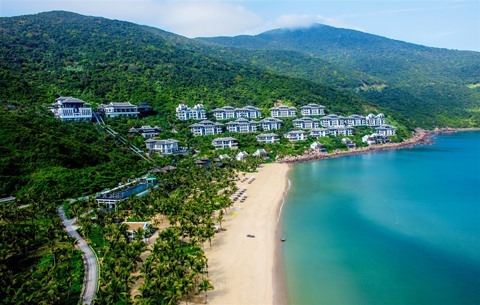 Keeping the resort green, with practical, meaningful activities, the Sun Group owner and operator InterContinental Hotel Group has turned the InterContinental Danang Sun Peninsula Resort into a new Green Resort icon, worthy of the title of the most nature-friendly resort in Asia 2018.